"Tumbleweed," "Russian thistle" and "wind witch" are common names for this symbol of the American west. 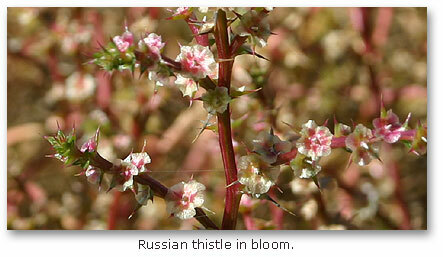 Russian thistle alludes to its Eurasian origin. Scientific names for tumbleweed include Salsola kali, S. pestifer, S. australis, S. iberica, and S. tragus. Salsola is derived from the Latin sallere, "to salt," in reference to the plant’s salt tolerance. There does not yet appear to be a consensus on the preferred scientific name, although S. tragus is the leading candidate for the inland variety of tumbleweed and S. kali, for the more coastal variety. 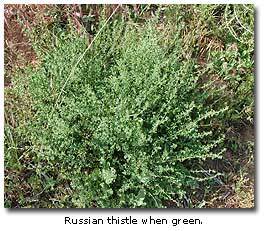 Virtually everyone recognizes a mature Russian thistle, which looks like the skeleton of a normal shrub. Plants may be as small as a soccer ball or as large as a Volkswagen beetle. Most people, however, would fail to recognize the seedling and juvenile plant’s bright green, succulent, grass-like shoots, which are usually red or purple striped. Inconspicuous green flowers grow at axils (where leaf branches off of stem) of the upper leaves, each one accompanied by a pair of spiny bracts. Mice, bighorn sheep and pronghorn eat the tender shoots. As it rolls down a desert road, Russian thistle plants do what they do best, disperse seeds, which typically number 250,000 per plant. Seeds are unusual in that they lack any protective coat or stored food reserves. Instead, each seed is a coiled, embryonic plant wrapped in a thin membrane. To survive winter without a warm coat, the plant does not germinate until warm weather arrives. When moisture falls, the plant is ready to uncoil and germinate. All that is required are temperatures between 28 and 110 degrees Fahrenheit. It then quickly sends up two needle-like leaves and begins to shoot skyward. By autumn the plant has reached maximum size, flowered and begun to dry out. A specialized layer of cells in the stem facilitates the easy break between plant and root, and the journey begins anew. Like many invasive weeds, Russian thistle exploited the destruction of native ecosystems. When farmers removed prairie grasses, they created a perfect environment, smooth and flat, for a plant that could roll across the landscape dispersing seeds. Herbicides now control the spread of Russian thistle by disrupting the maturation process of the plant. Although tumbleweed is native to the arid steppes of the Ural Mountains in Russia, it is now ubiquitous throughout the western states, growing in disturbed soils such as agricultural fields, irrigation canals and roadside shoulders and ditches. Plants thrive in salty and alkaline soils but will generally be outcompeted by natives in undisturbed habitats. Elevation range is from below sea level in Death Valley to over 8500 feet. Tumbleweeds were first reported in the United States around 1877 in Bon Homme County, South Dakota, apparently transported in flax seed imported by Ukrainian farmers. 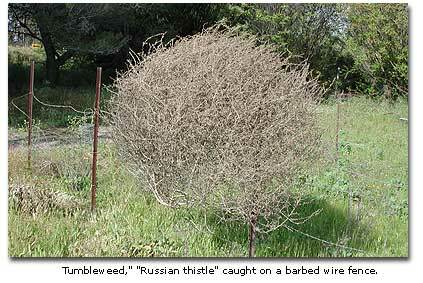 Within two decades the plant had tumbled into a dozen states, and by 1900, tumbleweed had reached the Pacific Coast. The peregrinating (highly traveled) plant also grows abundantly in Afghanistan, Argentina, Australia, Canada, Chile, China, Egypt, Greece, Hawaii, Hungary, Indonesia, Iran, Italy, Japan, Lebanon, Mexico, Morocco, New Zealand, Norway, Pakistan, Poland, South Africa and Turkey. The Sons of Pioneers made the song Tumbling Tumbleweeds popular in the 1940’s. A severe drought in the 1930’s in Canada led farmers to use young tumbleweeds as hay and silage for livestock.